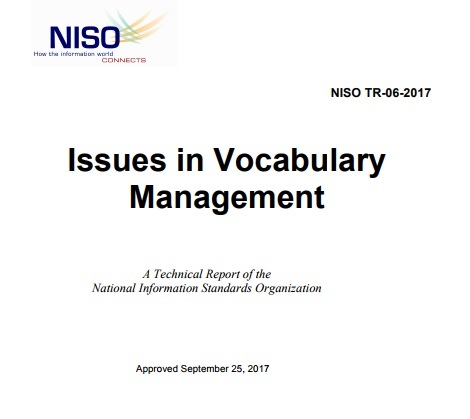 September 25, 2017 - The National Information Standards Organization (NISO) announces the publication of a new Technical Report, NISO TR-06-2017, Issues in Vocabulary Management. This document is one outcome of the NISO Bibliographic Roadmap Development Project, which was conducted in 2013-14 with funding from the Andrew W. Mellon Foundation. The report builds upon the work outlined in the 2014 project summary report Roadmap for the Future of Bibliographic Exchange by discussing policies supporting vocabulary use and reuse, documentation for vocabularies, and requirements for the preservation of RDF vocabularies. AGROVOC multilingual thesaurus of the UN is highlighted within the Section 5 of the report entitled "Vocabulary Preservation". starts with Libraries, Publishers, and Service Providers. But beyond these communities, this document might be helpful to many individuals and groups building and sharing bibliographic and other descriptive data, as well as knowledge managers within a variety of organizations using vocabularies to solve problems. The Preservation working group examined the landscape issue of "orphan vocabularies," where organizations abandon vocabularies for lack of funding or when the vocabularies cannot make the transition between print and digital. "In the future, we can imagine a broadly distributed ecosystem for vocabulary creation, maintenance, and use based on a commonly agreed URI infrastructure, built to support distribution of terms to consumers based on their explicit preferences. The Food and Agriculture Organization (FAO) implements such a model for AGROVOC and it is instructive to review its features. The maintenance of AGROVOC is decentralized, based on the VocBench Web service for editing, publishing, and maintaining vocabularies. Partners from the AGROVOC community can add their own translations to existing AGROVOC concepts, and add new, specialized concepts that fit local needs not yet addressed by the concepts from the ‘official’ core vocabulary. FAO recognizes and welcomes many contributors to its community of collaborators. New terms can be suggested using the centralized Web service. These terms can be submitted for integration in the core vocabulary and approved by the relevant editors. But they can also be used in local applications by these who created and need them, as soon as they are created in VocBench. In a truly Linked Data approach, thanks to mappings to other vocabularies, AGROVOC can also be used as a hub from which to access many other vocabularies available on the Web. AGROVOC is a large and well-supported effort, with a robust community that illustrates how flexibility and good management can build stability over time". *** "NISO is grateful to the many volunteer experts whose work contributed to this much-needed technical report," comments NISO Executive Director Todd Carpenter. "In the past, vocabularies were tied to particular collections and tended to become insular, but today we need descriptive information that works in the Linked Open Data environment. Enabling interoperability among systems and organizations is a major goal of NISO's work, and this technical report moves us forward in that area." *** Diane Hillmann, Principal of Metadata Management Associates LLC and co-chair of the Use and Reuse working group, notes that as well as offering a way for users of vocabularies to streamline their output, Issues in Vocabulary Management discusses the preservation of those vocabularies. "We've seen how often orphan vocabularies have arisen over the years," says Hillmann. "With this technical report, we aim to allow those using or managing vocabularies to ensure that their work remains viable and available for years to come."